These Eight-Foot Roulette Tables are Available with a Range of Wood Finishes and Upholstery Colors - New Lower Pricing! 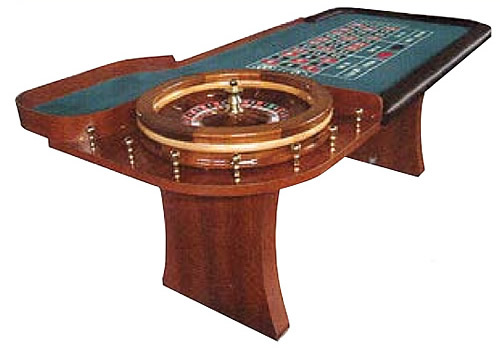 Our 8-Foot Casino-Style Roulette Table (#ROU1210) is crafted in the U.S.A., and it features overall hard wood construction with sturdy slab wooden legs. Each Roulette Table features a padded felt playing surface in the color of your choice, a money slot, and a removable padded armrest. This table measures 96"L x 48"W x 36"H (bar stool height) and can accommodate a 22" to 27" roulette wheel (sold separately). For additional information on our ROU1210 Wooden Slab Leg Roulette Table, please contact us at 1-800-233-0828. You might also be interested in our Eight-Foot ROU2910 Casino-Style Roulette Table, our Nine-Foot ROU1200 Roulette Table, and our selection of Roulette Supplies.